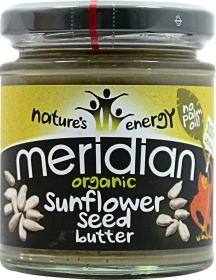 Meridian Foods https://www.zumub.com/images/large/meridian-foods/meridian_foods_org_sunflower_seed_170g_LRG.jpg 5MRD6761 There are no reviews yet. Have a question about Sunflower Seed Butter? What is it, what does it do, how and when to use or something else? Ask us. “Organic Sunflower Seed Butter 170g” is currently out of stock. Enter your details below and we will let you know when it's back in stock. “Organic Sunflower Seed Butter 6x170g” is currently out of stock. Enter your details below and we will let you know when it's back in stock. Try on crackers or crumpets, add to tray bakes, homemade loaves or dressings. WARNINGS Sunflower Seed Butter : Not suitable for other nuts, peanut or sesame allergy sufferers.